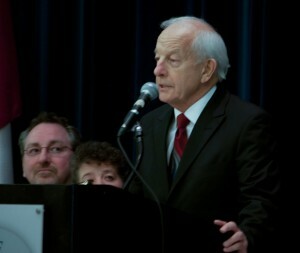 Gord Wilson, ATM, a 30-year veteran of Podium Toastmasters, speaks at the 2012 District 60 Conference. Upon joining Podium Toastmasters, you will receive Podium’s exclusive Members Handbook and manuals from Toastmasters International to help you become a better speaker and more confident leader. You will also have access to a wide variety of print and on-line educational resources from Toastmasters International. Plus, you will receive the award-winning Toastmaster, a monthly magazine that offers news and insights about speaking and leadership techniques. New members to Podium are assigned mentors who explain the program and help you prepare for various meeting roles and your initial speeches. Mentors offer valuable personal attention and support to ensure you get a confident and positive start to your career as a communicator and leader. Even seasoned members benefit from mentors, many who are business professionals with up to 30 years’ experience as Toastmasters. That’s because Podium is packed with novice and experienced Toastmasters. Regardless of your skill level, we’re all travelling down the same path, spurred by the support end encouragement of our fellow members. Podium is a forerunner, a leading club in Toronto to implement Easy-Speak software that automates meeting planning and tracks members’ speaking and leadership progress. Statistics show that members enjoy greater success when their progress is tracked with Easy-Speak. Podium members are trusted resources that other clubs and individuals rely on for our breadth of experience. In 2013, we welcomed members of other clubs to two workshops led by longstanding Podium member Gord Wilson, ATM. The success of these workshops – on delivering effective speech evaluations and judging a speech contest – precipitated requests to organize more workshops in 2014. 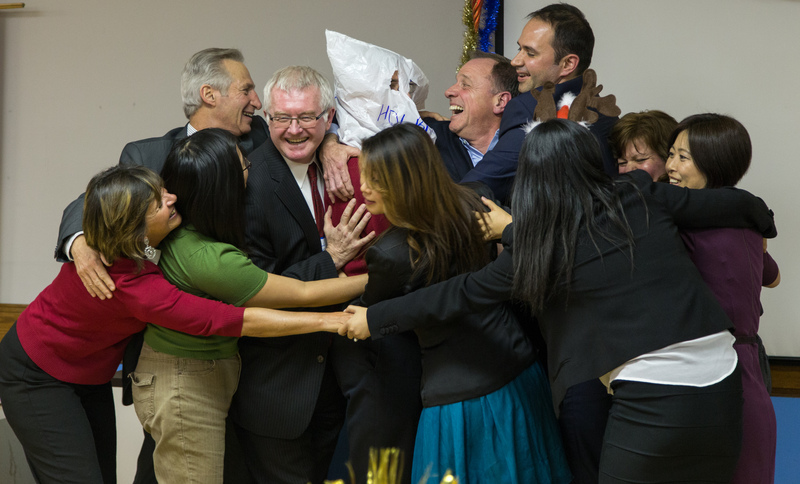 Colin Holbrow enjoys a heart-warming hug from his Podium friends as he celebrates his 30-year anniversary as a Toastmaster. Podium members enjoy a mutual respect and friendship that comes from spending every Tuesday evening together, some over many years. We are not exclusive. We openly welcome new members, and will encourage and celebrate your successes each step of the way.